The gentle curved arch and expertly profiled shelf give this fireplace immense charm. A fireplace designed to fit most occasions. Shown with, Brick Bond pattern design to Vermiculite chamber and Vista Quente multi fuel stove. The Moncado fireplace incorporates a honed black granite hearth, however we can supply with a matching stone hearth if so desired. The Vermiculite Brick Bond patterned chamber is also available in the following designs, Herringbone Brick design, Reeded design and Stone design. There is the option to select any of these designs enabling you to mix and match to your choice. The Vista Quente multi fuel stove shown, incorporates the following features: Very large glass panel to door, so you can enjoy watching the fire burn with maximum effect. Air wash system to glass. Attractive design. Up to 82% efficient when burning logs. Clean burn technology. CE approved. 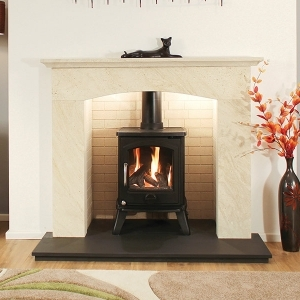 (Please see our stove brochure).